I have been wanting some area rugs in our place for quite some time, but the ones I like are not priced in a way that they could ever be an impulse purchase. When it comes to saving up for one there has always been something more important than floor fabric so my dreams were never realized. But wait! One day I realized - I have a ton of scrap fabric, and why couldn't I look for techniques to make that into my own rugs? Here is one result that is incredibly easy to accomplish and just as simple to care for. Cut up old tshirts into long strips (like one tshirt should be one super long strip). Usually I just do the midsection and use the rest as cleaning rags. Decide on the size you need and knit it up! I used size 10 needles and garter stitch. I didn't count my stitches, but guessed on the size I would need. 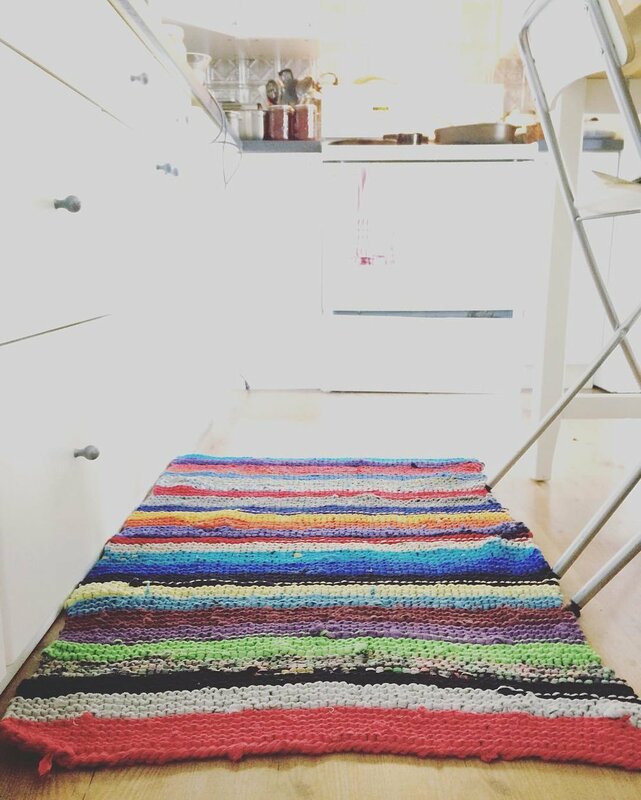 If you need to wash your rug it is super easy (this is why I decided to make this type for my kitchen). Since it is just old tshirts you can just throw it in the washing machine and also tumble dry! I am loving it so far and the chunky knit makes it much more comfortable to stand for a while at the sink doing dishes or peeling produce. An extra bonus is that it gives life to old things that were going to be discarded!